I've just read (some of) a long discussion about "hidden but trackable information". http://www.boardgamegeek.com/thread/110984/page/5 is the last page. This is information that is hidden in the game, but could be tracked by someone: card counting is an example of this tracking. Opinions about this vary widely, from "I always make this information not hidden" to "if some players are willing to track it and others are not, more power to them" to "it's unethical to track this hidden but trackable information". The reason it interested me is the second edition of Britannia. All previous editions of Britannia use a scoresheet to track victory points, and anyone can look at the points anytime. Fantasy Flight clearly felt that players must never be required to write anything down. At first they were going to put a VP track on the board, but I suggested that over the course of a long game there was far too great a chance that the victory points would be mistracked, especially with dice flying around and the usual player clumsiness. So they chose to include victory point markers. VP markers make the VP "hidden but trackable". Anyone can keep score the old way, and know exactly how many points the players have. Now, part of the exercise of strategy in Britannia is knowing what scores nations "ought to" have on average, and recognizing where the deviations are. The scoresheet makes it easy to keep track of this, so that players can spend their time analyzing the deviations. The most successful players can use the scores to help them decide what to do. The players who aren't quite at the top level tend not to think as much about the scores, or don't know the "expected outcomes" as well. To me, then, any player who wants to do everything he can to win, will get his own scoresheet and track the scores even when the VP markers are being used. It might be reasonable to agree before playing that players cannot write down scores, but some folks with good memories will track them anyway. I don't think you can force players NOT to track the scores. So practically speaking, I'd just keep the scoresheet, and use the VP markers to track things like Norse "touch points". Casual players, on the other hand, may prefer the VP markers. The initial games at the WBC Brit tournament took longer than old Brit, but that seemed to be a consequence of unfamiliarity, and games took less time as we went on. One person suggested to me that the new game was quicker because players wouldn't have to keep thinking about how to employ "floaters", the raiders that stayed at sea forever. Finally, someone thought the game would be faster because the Avalon Hill corruption that invaders had to worry about overpopulation after the first half of the invasion is gone. This simplifies invasions. I can't think the game is MUCH shorter, though. I am a bit puzzled by reviewers of boardgames who play the game once and then criticize the game in a review for weak play balance. The very idea that you can understand the play balance after one play is beyond me, when the game is asymmetrical, because even the best boardgamers won't figure out a complex game in one play. There are some games where people constantly disagree about the play balance--Britannia 2 is the obvious one, from my point of view--so how do reviewers get off with deducting points for poor balance after playing once? I recall a young player at the WBC Britannia tournament who, when he finished, said he couldn't see how he could have done anything differently (no, he didn't win). It was only after some expert players talked with him a while that he realized there were large choices he hadn't seen, and also, that even small choices made a difference in the long term. He had seen only the few big, obvious, choices. He may have been accustomed to Euro games, where designers try to make the range of choices obvious, though it isn't necessarily obvious which one of those choices you should select. They're trying to get rid of "analysis paralysis", too many choices that cause the player to think too much and take too long. 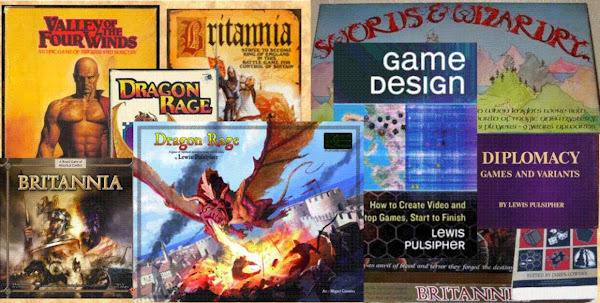 Some players LIKE lots of choices, and they are often the people drawn to a game like Britannia and some other wargames. I suppose you could dub this the "shallow play syndrome". It's fairly obviously related to the "cult of the new" syndrome. While it doesn't matter to me if people play that way, it's annoying when they don't recognize that that is what they are doing, and adjust their reviewing accordingly. 45 people, more than the tournament has had in 4 of the last 5 years, journeyed through the looking glass following the glittering promise of the new Britannia just published by Fantasy Flight Games. FFG’s repackaging of the classic game was universally admired by the crowd for its eye-catching graphic design. Only one mistake was universally declared by all, whoever decided that the Romans should be yellow when the board background had also been changed to yellow was clearly out of their mind. In the minds of most players, the Romans are purple and shall remain so for many years. But a change in color did not affect game designer Lew Pulsipher’s rewrite of the rules. Lew set out to rationalize the multiple versions of the rules that had been created, encourage more historical accuracy into the game play, and correct some of the clear imbalances of the game. Thus, the raiders floating at sea for hundreds of years that nearly drove the placid Lew apoplectic when he saw it at this tournament are no more, and shockingly, King Arthur will be visiting Scotland no more. As to balance between the colors, there was evidence that it may have been addressed. More years of statistics will be needed, but the tournament numbers are promising. This year was different from the years of the original Britannia where red and purple wins dominated the tables each year, with green years occasionally showing up, and blue frequently only grabbing one win, if any. This year, in the 17 heat games, yellow (also known as purple) and green each had 4 wins, while red and blue had 5 each. While the distribution of color wins were a promising statistic, the closeness of many of the games also gave evidence of the rebalancing of the game. One of the heat games resulted in a tie, advancing two winners to the semi-finals. Another of the heat games came down to a win by 2 points…in which the win was secured by a Saxon infantryman taking out a Norman cavalry in single combat. In the semi-finals, another tie occurred, with it being one retreat away, on the last battle of the game, from having been a 3-way tie. And another semi-final came down to a 1 point win. Naturally, the balance in the colors did not prevent blowouts in some scores. As usual, high scoring plaques were awarded for each of the colors in the heat games. Ewan McNay came back with a multi-plaque performance again, garnering an astonishing blue high score of 338, and a nearly equal red score of 294. A newcomer, Daniel Farrow, showed very well with green, pulling in a score of 253 in a game with several old hands at the game. Lastly, championing the yellow (purple), Ted Simmons, who has played many games but not won before, won in fine fashion with a top yellow (purple) of 244 points. Low scores did not abound, but, as Lew keeps reminding the crowd, Britannia is a dice game, and sometimes those dice turn against you. For that, we have the Ethelred the Unready award. Eric Kleist went to the semi-finals with a handsome blue win in the 2nd round. But a 3rd round game proved not so propitious as the dice turned against Eric’s Saxons and he pulled in at the end with 184 points. And at last, let’s go to the final. Although many newcomers were drawn to the republished game, apparently experience in the old game still tells in the new with four of the usual suspects making up the final game. Ewan McNay (Blue), Scott Pfeiffer (Green), Barry Smith (Yellow) and Llew Bardecki (Red) met Sunday morning. In a dramatic opening, 8 of Barry’s legions were killed, with 3 of them being lost when 6 of Llew’s Brigantes came streaming from the north and descended like locusts on March. Such was their wrath that they killed all 3 legions and the fort they garrisoned, and then had to lose a unit to starvation. However, Llew’s weakly defended Brigantes left behind in the north attracted an attack by the Picts on the Brigantes. Boudicca’s rebellion though, a new feature of turn 1 of the game, passed with a whimper, Boudicca storming into Essex and being cast back by the legions with no losses. Meanwhile, Scott’s Welsh, as has become the norm with the new Britannia, retired to submission to the Romans after killing 3 legions. But Barry’s spending of the blood of the dead legions paid off with his acquiring every Roman point possible on turns 1-3. After the passing of the Romans, the Germanic tribes came ashore in usual fine fashion, with the newly named Saxon leader Aelle building a fort in the Downlands surrounded by his mighty army. Apparently, distracted by the Saxons coming ashore to the south, the Brigantes signed a deal with the Angles and submitted when but a single Angle sauntered into the halls of Strathclyde. The deal left a crowded invasion for the Angles. But that distracted them not at all from their prime target as 10 Angles piled onto King Arthur, protected by two cavalry and two infantry, and dramatically slaughtered all of the Romano-British with a single roll. Meanwhile in the north, Ewan’s Picts, untouched by the Romans, and able to spread out and grow, maxed out their population, presenting a huge wall before the Scottish invasion. Barry’s Scots killed a few Picts, but his dice turned cold and the Ewan’s Picts rolled back the Scots into the sea, with a little help from some restless Angles in the south. And so, at turn 9, there were no Yellow pieces on the board, and none to return until turn 12 when the Dubliners appeared. A quiet mid-game was primarily of interest because of Llew’s creeping Brigante presence. The submission deal with Ewan’s Angles allowed the to grow. Unfortunately for Ewan’s hapless Picts, the only avenue for growth left to the Brigantes was to the North. By turn 10, Scotland became the northern kingdom of the Brigantes with Strathclyde, Dalriada, Alban and Dunedin being held strongly. With the quiet mid-game, it looked like Scott’s Danes would have a completely full board to attempt to storm. But a successful round of raids on turn 11 softened up the coast, and the armies ashore ran to hide from the impending Dane invasion on turn 12. Scott’s Danes swept through and killed many of Ewan’s Angles and a few of Llew’s Saxons, but unlike their more successful raids, the Danes were bled with nearly every battle and ended with few forces left to defend their newly acquired gains. Turns 13 and 14 were a mostly kingless swirl of chaos as the nations fought each other for enough breathing space to survive and grow. But Scott’s Danes, Barry’s Dubliners, Llew’s Saxons, and Ewan’s Angles balkanized England sufficiently for Cnut, even with his weakened armies, to still achieve a very short-lived kingdom. Turn 15 dawned. A red-green deal yielded Scott’s Welsh sending a mighty army of 4 units out to York to defend against Barry’s Norwegians. Meanwhile, the Norman’s faced a thin shield wall to the South with Llew’s Saxons having been thinned out by the strife throughout England in the previous 3 turns. Of course, when 9 of Barry’s Norwegians, along with the leader Harald Hardrada, descended on York, the mighty Welsh army shredded like mist, taking only 1 Norwegian with them. Heartened by their victory, the Norwegians then went to easily take the rest of their points, knocking more of Scott’s Welsh out of North Mercia and March for an invasion with a quiet denouement. Llew’s Saxons decided to defend King Harold by sheltering in the friendly hills of Wales and left a tissue thin defense of the coast, with only one Burh, the new wooded towns constructed by the Saxons, sitting on the coast. Scott’s Jutes in Kent and Sussex felt very lonely. Ewan’s Normans swiftly took advantage of the opportunity given to tear apart the Saxons. But Scott’s mighty Jutes took ill to the incursion by the Normans and killed 2 cavalry and 2 infantry, casting William back to Essex. Turn 16 came with exhausted armies everywhere on the board. Ewan’s Picts managed to struggle back into and hold their homelands. And a desperate grab at the end captured the last island for Llew’s Norsemen, but the empty lowlands yielded a victory for the Normans as they spread out. At the last though, the Normans were cheated of kingship by the last battle in which a Saxon infantryman killed one of the last Norman cavalry in another deadly single combat. When the dust settled, Ewan’s blue had scored 234, Llew’s red 228, Barry yellow (purple) 222, and Scott’s green 204. The win makes Ewan the 2nd 3 time winner after Scott Pfeiffer. Another great final for the Britannia tournament! While at least three quarters of Britannia players (according to one online survey) are satisfied with the role of chance in combat, it's certainly true that poor dicing can be frustrating. No matter how good a player is, if his luck is consistently bad he's unlikely to win. I'm going to describe a simple method that not only "evens out" luck during a game, but also speeds it up, because players don't spend time in physical gyrations before rolling, and in chasing errant dice after rolling. Get a deck of playing cards (or two) for each player. Take out all but the Aces through 6’s, and shuffle. Players turn over the top card for each die roll. Three dice, three cards. When a player's deck of 24 (or 48) is exhausted, shuffle and start again. Over the course of the game each player will "roll" about as many 1's as 6's, and so on. The only problem that might arise is players "counting cards", that is, memorizing which cards (or how many 5's and 6's) have already come up. If so, two decks of cards per player will make that memorization harder, though it will increase the variance of chance over the course of the game as each player will likely have more cards left unused at game end than when using one deck. If players still insist on “counting” cards, this will be acceptable to many. After all, this allows players to “manage” their luck. If they know they have a lot of 5’s and 6’s coming up, they may choose this time to move into difficult terrain; of if they’ve used up lots of high numbers, they will realize it is not a good time to be fighting Romans or cavalry. Turning over cards isn't as exciting as rolling dice, but it's a lot quicker and "fairer". Alternatives to playing cards: Use the "business card" template in Word or WordPerfect to create your numbered cards. Print them on ordinary paper and put them into "card protectors" that are used by fans of collectible card games, or print on business card stock (buy at office supply stores) and use without protectors. Or just write the numbers on paper or business card stock. Or write numbers on plastic chips or cardboard chits and pull them from a cup—just remember to draw all of them before refilling the cup. Don't use this method for a game where you roll and sum combinations of dice (e.g. 2d6 or 3d6); it skews the results away from extremes (such as a 2 or 12 for 2d6), though the more cards in the deck, the less skewing occurs. In my playtesting Yahoo Group I had a couple instances of spamming, so I switched to requiring new users to say something about themselves. I've had two cases where "new users" said nothing, and didn't reply to my query. Surely this isn't worth the time for these spammers? Worse, some idiot has figured out how to automate entries to my feedback form on my Website, so I have dozens of little spam messages. In a month I get more than 2,200 spam e-mail messages. Of course, if foolish people would stop responding to spam (buying the product or service), it wouldn't be worth doing in any case. I was at WBC (World Boardgaming Championships) the first week of August. I watched 22 B2 games in the tournament (and a bit of one pickup game) as well as having B3 played one and a half times, and a few B2 scenarios as well. What I had resigned myself to, came to pass by the semi-finals: in the last five games, the Romans maxed their Round 3 points in four (80 points), and missed max in the fifth game because one territory was missed and the Roman failed in a 2-1 attack on Boudicca and one army (both Romans died!). I believe in that game the Picts did not submit; in all the other games, all eligible submitted. In many cases they put up a decent fight (Brigs killing three Roman armies and a fort in the final), but they submitted. The difference is how many the Romans get in R5, and how many points the non-Romans score. The Romans do not have to take a lot of chances to achieve this result. If they did, the result would not be so consistent. I am not thrilled at this result, though it does illustrate historical Roman power. If I had it to do again I might reduce the number of Romans back to 15, though more likely I'd give the Picts (and maybe the Brigs) the option of revolting if the Romans leave no garrison up north (as is often the case). At WBC many of the English players refuse to expend armies in raids on the Romans unless a fort is undefended by an army. If more armies had to stay north, there's be more targets further south. OTOH, I read about people who have so much trouble with the Romans, that it might be bad if I'd made it even harder. There is definitely a learning curve here, and some people assume that if they have trouble the first time, then the Romans must be at a big disadvantage ("hosed"). I only saw the Romans achieve this max once in the preliminary three rounds (17 games), but people were learning. Many had not seen B2 before. In B3 I already have the Welsh (with Caratacus) moving after the first half of the Roman MI; I may include revolting opportunities (double meaning there, from the Roman point of view) for Brigs and Picts as well. I will also venture this: any Roman who does not take Devon in his first move, and does not take Downlands before the Belgae submit, has Screwed Up BigTime. The tournament had 45 participants, up from 34 the last two years. Apart from two games at Origins, this was the first time I'd seen people playing the published version of B2. More in the next couple weeks.